Back to the garden with Mr Digwell is a mine of friendly information for anyone wanting to grow their own vegetables whatever size garden they have. 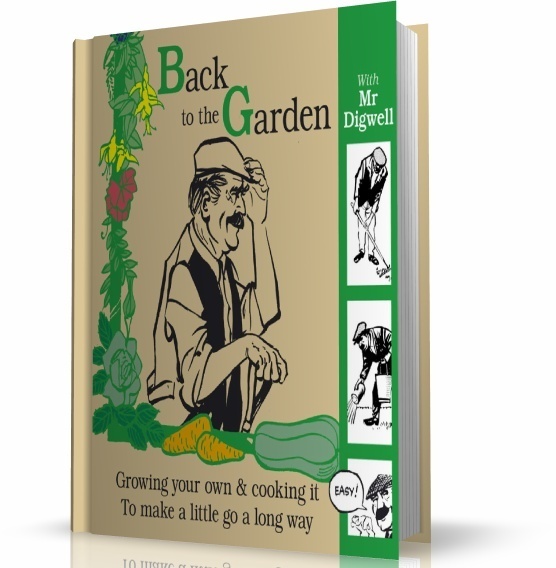 Packed with how to's, what to's and when to's, Mr Digwell's easy to understand cartoons give new and old gardeners alike the exact information they need for vegetable growing success. Mr Digwell is the friendly uncle leaning over the garden fence helping you out when you need it. In the gardening world he has done everything, tried all the seeds and techniques, knows what will work and what will end in tears. Back to the Garden with Mr Digwell combines the concepts of up-to-date gardening with the ethos of yesteryear. Organic and practical, easy to understand, Mr Digwell’s smiling face reassures the gardener by answering the major gardening questions before the gardener has even thought of them. What Mr Digwell grows in the garden is cooked by Patsy and a slice of nostalgia brings us not only the best gardening tips in the world, but some fine recipes too.